You are currently browsing the category archive for the ‘Local Food’ category. Wrap beets in foil and roast in a 350 degree for @ 1 hr. or until tender. When cool, peel and chop. Saute onion in oil. When soft, add carrots, squash, beets and cabbage. Cover with chicken broth and simmer until all vegies are soft. Puree in blender in batches. While blending the last batch, add the sour cream and mint and blend until the mint is chopped and the sour cream well mixed. Stir this into the rest of the pureed soup. It should be shocking pink now. Add the vinegar, worcestershire sauce, sugar, salt and pepper to your taste. Chill before serving. In a food processor, process mint, anchovies, garlic and olive oil until mint is well chopped. Add remaining ingredients and pulse till the mixture becomes a coarse puree. Every year when I order my garden seeds, I imagine myself starting a fall crop of cold-tolerant veggies after the summer harvest is over. Not once have I ever followed through, in spite of ordering countless packages of broccoli seed. Whereas planting seeds in the moist spring soil feels fresh and hopeful, by hot mid-July (when I’m barely keeping up with the bugs and weeds) it has no magic. Fortunately, we are surrounded by farmers who do plant for fall, who can provide us with fresh local vegetables all winter long, available at a growing number of winter farmers markets. But we’re not talking tomatoes and beans, we’re talking about hearty greens and root vegetables, as well as the veggies that store well like potatoes and winter squashes. You have to make seasonal adjustments in your cooking, but that’s okay…there are plenty of recipes that go well with winter. Saute the onion and ginger in the oil until translucent. Add the garlic and cook for 45 more seconds, till fragrant. Add the broth and rice and bring to a boil. Add carrots, squash, and dry spices. Reduce heat to medium and cook until vegetables are soft and rice is cooked. Add coconut milk and stir. Thank you to our neighbor Fred’s daughter, Liberty, for the Kale Salad below. After I had it at Fred’s house I pestered him till I got the recipe. It’s an answer to the question, “What the heck do we do with all this kale?” asked by anyone who belongs to a CSA. 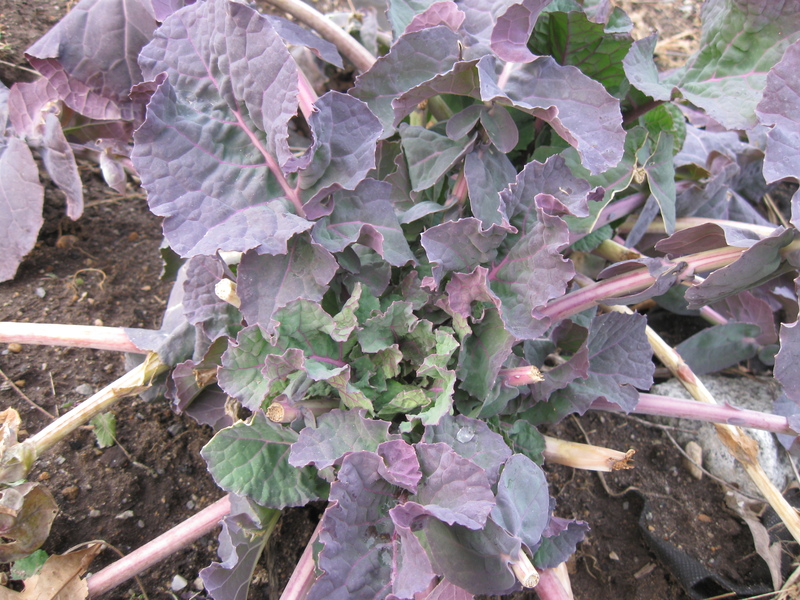 Grip the kale firmly and strip leaves from stems to make “pants.” Cut into thin slices. Massage the kale in a big bowl with the olive oil to break down the fibrousness. Add salt and massage more. Add the other stuff. Puree all dressing ingredients in a blender until creamy, toss with the salad. Leftover dressing is good on all kinds of other salads. With clamming, as with so many other things in life, it’s location, location, location. 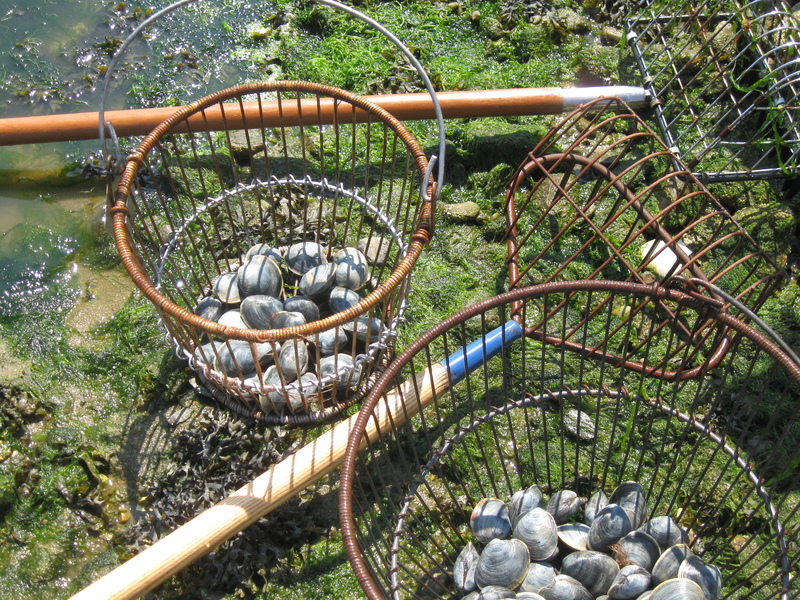 A couple of weeks ago, my friend Mame and I went clamming off Scudder Lane in Barnstable Village. Clearly there were some clams around because others were finding them, but for us it was zilch, nada, nothing. Very ungratifying. Yesterday, however, at a beach in Osterville, it was a different story. I came home with a basketful of lovely cherrystones and made Portugese Clams and Rice for dinner. I have to admit there’s an atavistic excitement to capturing my own food. “Oh, baby, come to mama,” I’d croon as I fished the clams out of my rake. “Cause I’m-a-gonna eat you.” Somehow I’d morphed from a person who rescues spiders trapped in the bathroom sink, to the big bad wolf waiting to gobble up Little Red Riding Hood. Is this any way for a nice Buddhist girl to behave? Maybe. You see, I’ve never completely bought the Buddhist precept of non-killing, which most interpret to mean never eating meat. There are many reasons that someone might chose vegetarian diet: because it may be healthier, or because we’re repulsed by the cruel and unnatural way animals are raised in modern industrial farming, or to lessen our impact on the planet. I’m sort of slouching towards vegetarianism myself. But to take the position that killing another creature for food is morally wrong seems a bit out-of-touch. One thing that’s obvious about the universe we live in is that all life exists by subsuming other life forms. This cycle of destruction and regeneration isn’t some perverted system that greedy humans came up with. It’s the very ground of our existence. To disapprove of it seems – well – presumptuous. It’s like saying that we should be above and separate from the natural world. There are religions that believe this, but it doesn’t seem that Buddhism should be one of them. The Buddha said that resistance to Things As They Are is one of the root causes of suffering. And is not our omnivorous place on the food chain one of those things? Of course that means that we have to be equally open to getting eaten by a bigger predator…a tiger or a big bad wolf. Oooh! Now that’s a little harder to swallow. More practice is necessary. At 7 a.m. this morning I was out gathering oysters with my friend, Mame. Last time I had a shellfish permit, it took forever to find enough oysters of legal size, but not this year! People have been saying it’s a fantastic year for oysters, and they are so right. The sand at low tide was just littered with big ones. Heat the milk, bay leaf, celery, and onion in a saucepan and bring just to the boiling point. Put oyster and their liquor in another kettle and bring to a boil. Cook just until the oysters curl. Strain the milk over the oysters. (Discard the solids). Beat the egg yolk into the cream and add other seasonings. Add this to the stew and heat. Swirl in the butter. There are four assorted fruit trees in our yard. We do nothing to encourage them – no pruning, no spraying – so usually they yield a scattering of malformed, worm-riddled fruits that fall to the ground without ripening. But every once in a while, one of the trees gets happy. Two years ago it was the peach tree. This year it was the apple. There must be a thousand apples on this tree, and while not completely spot-free, they’re big and tasty. I think the variety is Honey Crisp, which is a sport of Golden Delicious. 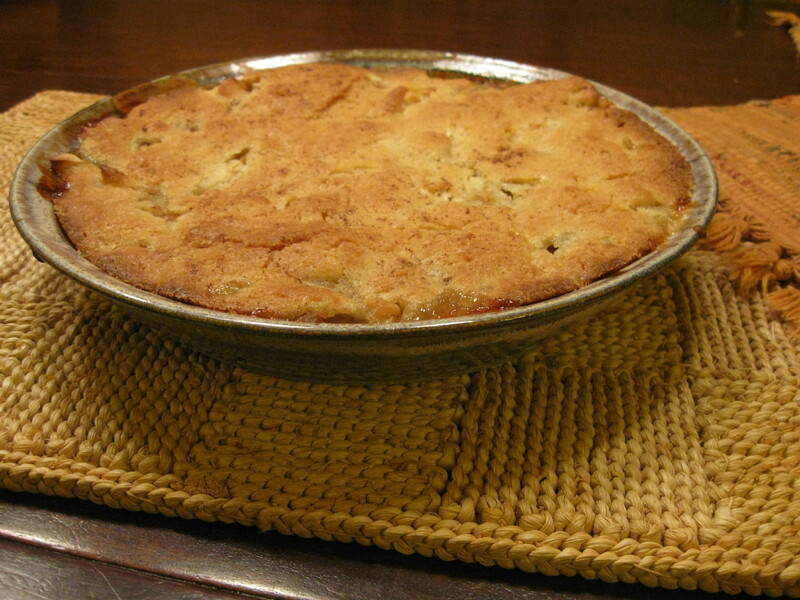 This Swedish Apple pie is really good, especially warm with a scoop of vanilla icecream. But let me tell you the best thing about it: you can start it when your guests are in their car on the way to your house, and have it in the oven by the time the doorbell rings. It’s that quick! Peel and slice 3 – 4 pie apples (Granny Smiths are good) and toss with 1 TBSP sugar. Mound in a pie pan. It should be 2/3 full. Last spring I ran across an article from Prevention magazine titled Seven Foods That Should Never Cross Your Lips. And what do you think was #1 on the list? Deep-fried snickers bars? Pork rinds? Double-bacon cheeseburgers? Nope. Apparently the resin lining in canned tomatoes, even virtuous-looking organic ones, contains bisphenol-A, a synthetic estrogen that’s linked with reproductive problems, heart disease, diabetes, and obesity. Ick! I use lots of canned tomatoes, so this gave me pause. I tried substituting tetra-pak brands like Pom, but thought they tasted funny and the texture was weird. So in a fit of springtime garden-planning ambition, I decided to plant a whole bunch of tomatoes and put them up myself. Celebrity was the variety that many mid-western country ladies on the web recommended for canning. It’s not a paste tomato like you’d use for sauce, but it’s easy to grow and determinate, which is important if you want all the fruit to ripen at more or less at the same time. I put in a dozen plants, in addition to my regular eating tomatoes. Unfortunately, this wasn’t a great tomato-growing year in my garden. It wasn’t as bad as 2009, when everything succumbed to early blight, but still. 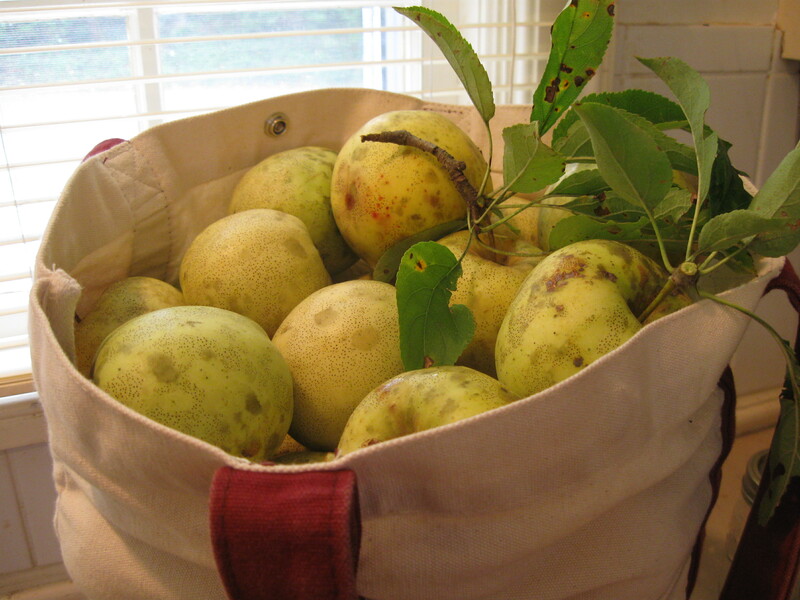 The heirloom varieties were afflicted with nasty blossom-end rot, and all the rest were mysteriously slow to ripen. Eventually though, just a few weeks ago, they began to turn orange. And for the past few weeks, whenever the collection on the kitchen counter reached a critical mass, I’d blanche and skin them and toss them into freezer bags. These droopy bags aren’t as pretty as glass jars, but boy are they easier to do! In the end, though, I don’t have nearly tomatoes to get through the year. Which leaves me with my original dilemma. Does anyone have a solution to the killer-can problem? And how about the other foods we should absolutely NEVER EAT? I confess I still eat numbers 2, 3, 4, 5, 6, and 7. See the list here. Or see a more whimsical take on the problem here. The other day, a friend mentioned that she sometimes takes the ferry to Martha’s Vineyard and back without getting off the boat, just for the pleasure of being on the water. This got me thinking. I tend to regard going to the Vineyard as a big production, involving advanced planning and expensive reservations for both car and lodging. But why? It’s only $15 round-trip without a car, and the boat ride takes barely half an hour. So last Saturday that’s where we went. But unlike my friend, we got off the boat. The first thing we did after arriving in Vineyard Haven was to walk to ArtCliff Diner for lunch. Sitting at the counter, I had a sandwich of pulled pork and spicy coleslaw on a toasted chiabata that had me practically moaning, it was so good. Then, because the Vineyard Film festival was going on, we caught a 2:00 showing of the documentary Babies. Then we spent a couple of hours poking around in shops and bookstores. As the sun started to set, we sat on the porch at Zephrus Grill, enjoying sangria and calamari salad. And finally we caught the boat back. We were home by 9:30. Doesn’t that sound like the perfect day trip? Each September, I mourn the passing of corn as much as any other part of summer. I love fresh-picked corn, so much so that I’ve probably gained three pounds this summer entirely from corn and butter. It makes sense to pig out during the short corn season. Good fresh corn is one of the few things you absolutely cannot get off-season. Yes, you could say the same about good tomatoes, but I think those cherries that come in the mesh bag make a decent substitute. The same cannot be said about the corn you see in the supermarket in December. My love affair with corn dates back to my college years, when I spent several wonderful summers working as a field hand at the Potomac Vegetable Farm in Northern Virginia. In those days, the farm was staffed by a hippiesque bunch of college kids who bunked in various rustic sheds and barns around the property. Sanitary facilities consisted of outhouses that were home to the most fearsome spiders, and bathing (when it occurred) took place in Moutoux’s Pond. It was a great time. Cornpick started very early there. Each morning, we’d assemble in the chilly pre-dawn darkness and pile into a trailer hitched to a tractor. 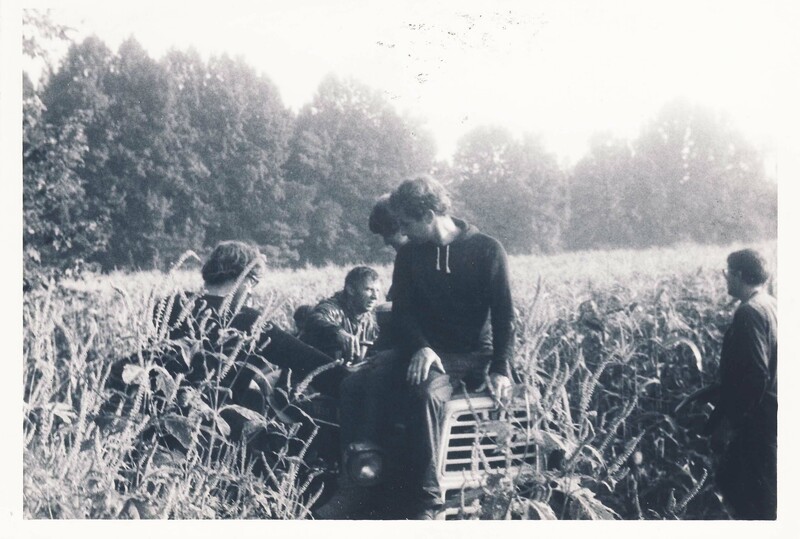 Soon we’d be rattling down the deserted highway towards the corn field, where we’d fan out behind the moving tractor, ripping ears from their stalks and tossing them into the trailer. By the time the sun was over the horizon, we were back at home base, sorting and packing for the wholesale market. If it was still cold, there might be a bonfire where we’d roast ears till the husks turned black and the kernels inside were toasted and sizzling. 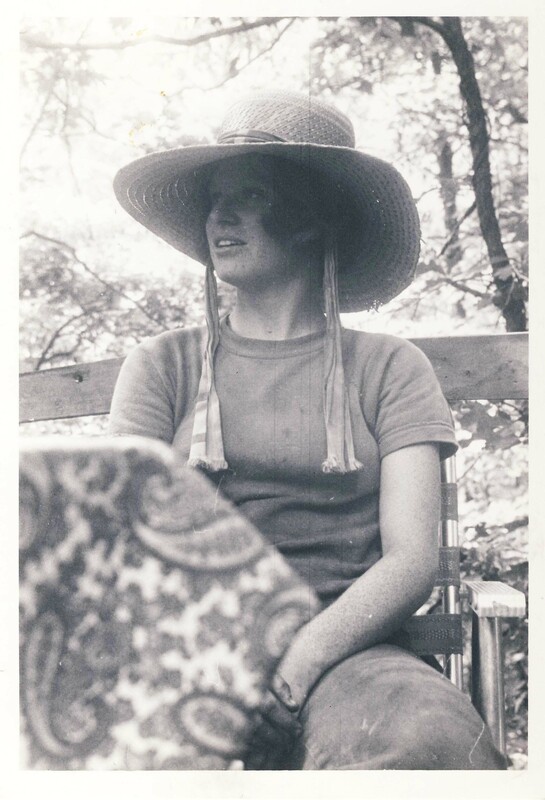 Once a week, there was a big communal meal prepared by Hiu Newcomb, who owned the farm with her husband, Tony. One of Hiu’s regular dishes was delicious corn pudding. This recipe is a close approximation of hers that I’ve made many times since. It’s quick to assemble, can be cooking while you prepare the rest of the meal, and is a good way to use up leftover cooked corn on the cob. Melt the butter in a saucepan and saute the onion until soft. Pour the milk and cream into the pan and heat till warm. Add the eggs and seasonings, whisking till mixed. Pour the mixture into a 1 ½ quart buttered baking dish. Mix in the corn and top with cheese. Preheat oven to 325 degrees. Place the corn dish in a pan of hot but not boiling water, and slide into the center of the oven. Bake for about 50 minutes until the center is set. I ran across this term recently in another blog, and it stuck with me. It’s a succinct way of describing those moments when tightness triumphs over the impulse to be generous. I had a Generosity Fail yesterday at the Orleans Farmers Market. A pleasant silver-haired guy stopped by my table to tell me he’d bought a lot of bars last season and given them to his family members as stocking stuffers. They were a big hit. At that moment my attention was drawn away by another customer at the table, and when I turned back, he had moved on. Dope! I thought. Why didn’t you just pop a nice bar in a glassine bag and hand it to him? “Here….try it! It’s a gift.” Not because it was good marketing, which of course it was, but because it’s nice to give things away. The freedom to give people stuff is one of the perks of being the business owner. I also encourage my employees to err on the side of generosity when dealing with customers. Giving things away frees up energy. It’s fun. In that instance, it wasn’t exactly a case of stinginess triumphing over generosity since I didn’t care at all about making an extra $2, but of simple inattentiveness to the opportunity of the moment. Oh well. Generosity Fail. Better luck next time.